So perfectly sweet and salty, these twelve chocolate covered pretzels are an absolute delight to receive and enjoy. Each pretzel twist is hand-dipped in a variety of Belgian chocolates, then decorated with sprinkles and toffee. The richness of the chocolate meets the crisp pretzel texture for a flavor sensation with every bite. 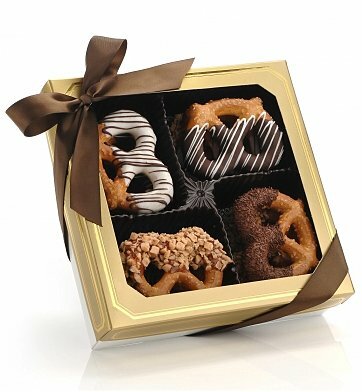 The dozen pretzels are packaged in gold-accented gift box that is tied with a coordinating organza ribbon. It's the perfect gift for making someone's day extra-sweet! Gift arrives presentation-ready in a gift box with hand-tied ribbon. Cool packs added for shipping during hot summer months to prevent melting. if ordered by 8:00 am EDT Monday April 29th. One Dozen Chocolate Covered Pretzel Twists is a hand delivered gift. These gifts are delivered by one of our local design centers located throughout the United States and Canada. Same day delivery is available for most gifts when ordered before the cutoff time. The cutoff time for One Dozen Chocolate Covered Pretzel Twists is 11 AM in the recipient's time zone. Twelve gourmet pretzel twists made with fine ingredients. Hand-dipped in milk, white and dark Belgian chocolate. Coated in rich toppings like milk chocolate sprinkles or toffee. Gift tree never disappoints! Thank you for your personal detail and professionalism. Nice surprise. Box, ribbon and pretzels all arrived in excellent shape. Assured by the extra care in packaging with a cold pack. Best of all they are delicious. Am very pleased with this experience. Pretzels were great and well received.....thinking about ordering some for myself! A great gift for everyone! Very fresh tasting and as always the ease of ordering and delivery was exceptional. this purchase was a thank you gift for an individual with options for sharing. the site was easy to maneuver, received email with tracking number once order was processed. Arrived on time to recipient. I am very satisfied with ordering and will be using site again in the future. Client loved it. It was affordable, lovely, and a little different. Our clients loved this unique take on the chocolate covered pretzel. Many have indicated how was a nice change from the standard gift basket. We chose this gift becuase of the elegant feel that the box and ribbon had.